A little girl blowing on a dandelion! 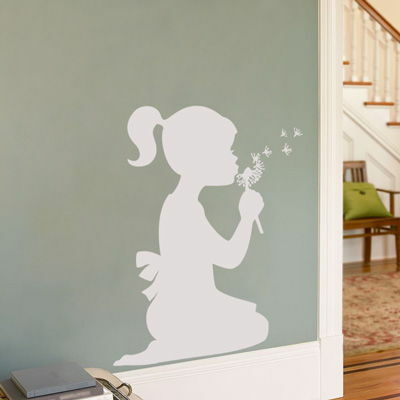 Reminiscent of childhood, this pretty silhouette decal measures 22" wide by 35" tall. Shown here in matte white, but available in all of our colors! Please contact us if you would like a different size. We ordered two decals (a tree and a set of owls) for our baby's nursery and we are thrilled with the results! The decals arrived extremely quickly. It took very little time to get them up and they look fantastic. People who saw the decals thought we had actually stenciled the tree and owls on the wall. Overall, we were very pleased with Dali Decals - we're actually looking for places to add more decals! Thanks for your great product and great service. We love our decals and totally have Decal Obsessive Disorder now! I asked for expedited handling and even though I ordered it a bit late in the day they were ready to go the next day! Good packaging, not a ton of packing material to toss. Really quite easy to apply, but we took a lot of time planning. The instruction video said 1.5hr but we took about half a day - mostly with planning and getting fancy with leaves going behind branches etc. We also got the coral decal - love that! The canvas print was very high quality, and they somehow got the foreground to print thicker so that it almost looks three-dimensional! Advice on applying: anything that has parts that sticks out - branches, the coral sections, etc., cut that section separate from another section but leaving the "base" attached to the main decal - i.e. let it have "fingers" still attached to the main "hand" - easier to apply and keep it smooth. Decals also do bend around corners -just keep it tight up to the corner. Will definitely be ordering more prints and maybe other decals too! Excellent quality, and gorgeous art ! I'm addicted ! Even my laundry room looks great now !